A skirmish erupted between the Tatmadaw and the Karen National Union (KNU) in the area controlled by the KNU Brigade 5 in Hpapun (Mu Traw) District in the Karen State on July 12 while the third session of the Union Peace Conference (21st Century Panglong) is being held in Naypyidaw. The Karen National Liberation Army (KNLA) Brigade 5 commander Brig Gen Saw Mu Heh confirmed that the skirmish broke out near Khay Pu under Lu Thaw Township in the KNU’s Mu Traw District, where military tensions rose over road construction issue in early March, and one person died from the Tatmadaw’s side. “[The skirmish] took place due to the breach of the territory. One person died. A short [fight] broke out at 9:40 am. It was their fault. We fired because they violated our rule. We wouldn’t shoot if they didn’t violate it,” he told Karen News on July 15. 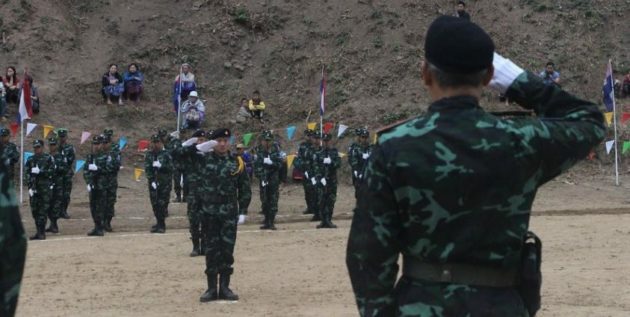 Brig Gen Saw Mu Heh continued that the KNU has established a 100-yard limit in all territorial boundaries after signing a ceasefire with the government and the skirmish is unlikely to create a bigger issue between the Tatmadaw and the KNU. The Tatmadaw and the KNLA clashed in early March after the Tatmadaw entered the KNU-controlled area to repair the old road between Khay Pu and Ler Mu Plaw. Over 2,300 residents of 16 villages within the vicinity of the road were forced to flee for their lives and they are still unable to return home. The KNU signed the nationwide ceasefire agreement (NCA) together with seven ethnic armed organizations under the previous U Thein Sein administration on October 15, 2015. Twenty-nine KNU delegates are attending the third session of the Union Peace Conference (21st Century Panglong) in Naypyidaw from July 11 to 16.